Fashion Technology is inevitable. As our technology evolves in the world so does the technology of every industry including fashion. Not only is the technology evolving but it is inspiring the clothes. Pictured above is an Emilio Pucci Dress that features a tourist holding a selfie stick. Pucci usually is known for its scenic prints, but it has truly captured the technology of our era in high fashion. This piece will seem outdated fast, but it will definitely have its vintage comeback in the future as well. Most recently, the virtual dressing room has arrived. This mirror created by Samsung allows you to try on the clothes without even putting them on. The mirror was recently shown at a shopping showcase in Hong Kong. Consumers in attendance experienced an image of themselves in a necklace by Chow Sang Sang Jewelry. 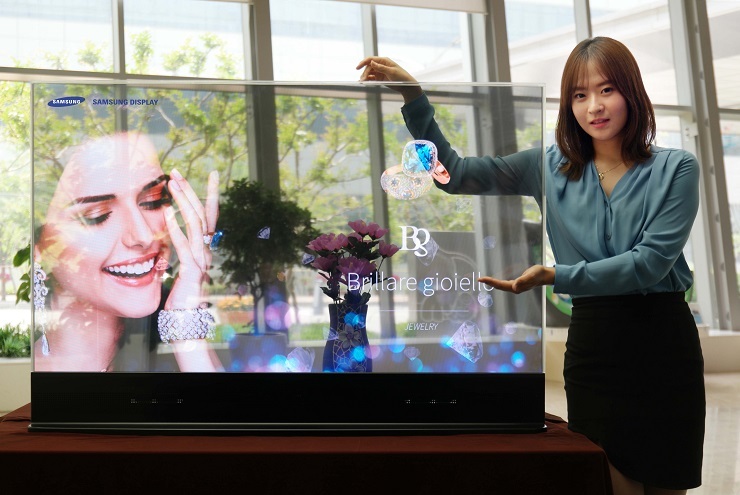 Samsung believes these mirrors will not only replace mirrors in retail stores but at home. This is such an amazing tool that I would love to use. Half the reason I enjoy online shopping more than going to the mall is the hassle of having to try everything on. Trying on clothes is extremely important, but it leaves me stressed out and unwilling to spend the time trying on a bigger or smaller size. Dressing rooms can be chaotic and have horrible light, where this mirror gives you a simplistic and quick experience. Hopefully these transparent mirrors make their way to stores in a timely fashion. Virtual reality fashion shows have also become a popular trend for brands to experiment with lately. Most recently Dior has created a 3D backstage view of their fashion show that displays models putting on makeup, photographers and even shows the head designer Raf Simons working backstage. Viewers get to see a 360 degree view of the backstage area. Dior has been the most recent brand to also take on these virtual headsets, which are available only in select stores though. This chic video shows the making of the headsets. Many brands have been utilizing this new virtual headset tool to show their actual fashion shows in stores. Topshop used the headsets for fashion week in 2014 for a live experience. The virtual show allowed consumers to be front row, backstage, on stage or above the stage. This also included being up close and personal with celebrities taking selfies. Here is Topshops promotional video from last year. Hope you enjoyed this weeks Fashion Tech news.